While the announcement for Kingdom Hearts 3 came a little sooner than director Testuya Nomura may have wanted, simply getting confirmation is a relief for fans who have long been waiting for an official numbered sequel. The game is still in early stages of development, but Nomura did offer a few points on what we can expect. Speaking with Weekly Famitsu, Nomura stated that they are still trying to decide what new worlds to introduce. The main crux of the game however, is the final confrontation with the series antagonist, Xehanort. Sora, the main protagonist – having become a Keyblade Master in the previous game, Kingdom Hearts 3D: Dream Drop Distance – will now have the ability to change the shape of his Keyblade, much like the character Aqua from Kingdom Hearts: Birth by Sleep was able to. As seen in the announcement trailer, some enemies will be large enough to ride on. This will be an option in battle with such enemies. Online features for the game are also currently on the table, although Nomura did not specify the nature of these features. On the visual front, the development team has settled on a visual style called the "Kingdom Shader" among the staff, which rather than opting for a more realistic quality, gives elements a softer Disney brush-like quality. Nomura noted that the graphics will be a much richer evolution of what players have seen up to now. Asked whether players would be able to control other characters in the game like Riku and Kairi, Nomura only answered, "I will not deny the possibility of that." 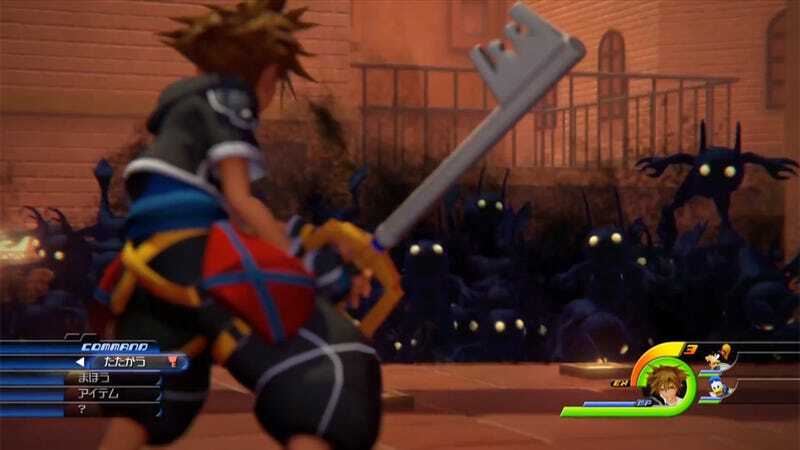 Nomura stated that he would like to make further announcements at this upcoming September's Tokyo Game Show 2013.
edit: While some plot details mentioned in this article conflict with plot points from Kingdom Hearts 3D, the original question to Nomura specifically states that Sora became a Keyblade Master; something that Nomura neither corrects nor denies in the interview.